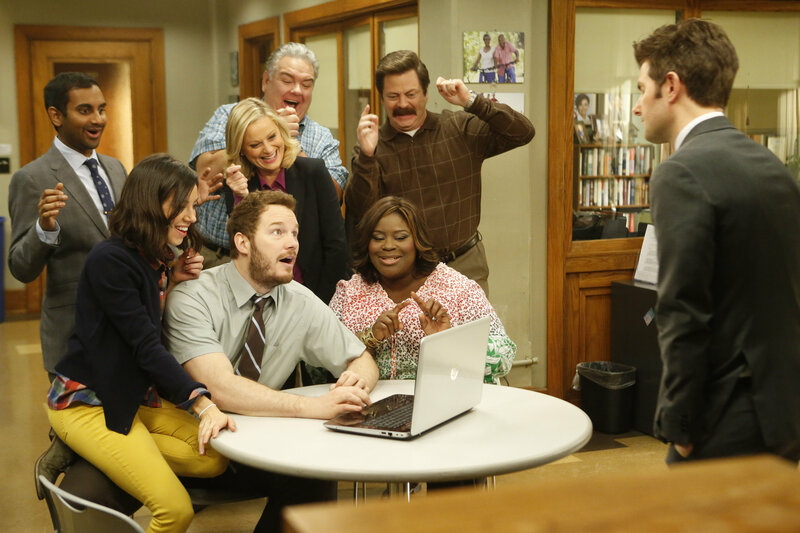 Last night marked the end of NBC’s Parks and Recreation, which ran for seven great seasons. Sure, it never got high ratings, but it did bring the phrase “Treat Yourself” into the lexicon. Let’s see Two and a Half Men invent something that gives you an excuse to go shopping for toys. Parks and Rec was good for more than just a laugh (although, it delivered plenty of those), it marks the end of an era for network sitcoms as NBC tries to wade in the murky waters of the current TV landscape of streaming and cable. There was something about Parks and Rec that made me feel warm and fuzzy inside each time the opening credits rolled. But there is something else that sets it apart from all other sitcoms. All of you literary snobs out there might be familiar with the Great American Novel, which is the idea that one book possibly encapsulates the culture and values of the United States. Some think its The Great Gatsby. Others say its The Catcher in the Rye. I say its whatever you were forced to read in English class during sophomore year of high school. Anyway, the idea of America seems to hard to capture in just one thing, but if there ever was a Great American Sitcom, it would be Parks and Recreation. And why not? If something is going to be “great” and “American,” it might as well be a TV show, which has the luxury of time to explore a lot of huge ideas. And much like our soft drinks and our cars, the idea of America might be just a bit too big. Parks and Rec is a beautifully uncynical look at American politics, highlighting everything from the inefficiency to the effectiveness of local government. If you have ever attended any kind of public forum, then the town hall meetings depicted on the show, which mainly turned into (sometimes physical) shouting matches, rang all too true. Parks’ satire extended far beyond the reaches of bureaucracy; it always seemed to have a strong grasp on the lexicon. After all, season seven was set in the future and was partially about data mining and drones. From Entertainment 720 to Gryzzl, Parks and Rec was about the only show on television addressing startup culture. That is, of course, until Silicon Valley came along. Part of what makes this show the Great American Sitcom is that each character inhabits and defines some part of the social or political landscape. Wide-eyed Leslie Knope embodies strength, optimism, and the idea that people actually want to do good things for each other. For years, Ron Swanson was her ideological counterpart. As a libertarian who enjoys hiding out in his cabin in the woods, Swanson is basically Henry David Thoreau by way of Ron Paul. Despite their differing beliefs, the two of them formed one of the truest friendships in TV history. Mainly, they were able to find common ground over JJ’s Diner, a Pawnee institution. Seriously, is there anything more perfectly American than kibitzing in a diner? Edward Hopper probably wants to create a painting about it. One of the most impressive parts about Parks was its ability to give life to its entire ensemble. Plenty of other American archetypes were present as well. Beloved Jerry (or Garry or Larry or Terry) represents the mentality of doing the least amount of work possible that still gets you paid and home to your family. So of course, he became the mayor. Tom is the worst of the tech bubble, yet for every terrible idea he had, there was one or two that he actually put a lot of thought into. This show had such a bright and sunny point of view that, in the end, Tom’s greatest success ended up being a book he wrote about all of his failures. Few things define the show as well as that. At first, it might sound strange to label this as the Great American Sitcom. When people look for the Great American TV Show, they probably look right to HBO. Sure, it is just human nature to view the current time as dark and gritty. But Parks and Rec is the show people will look at in the future when they want to feel nostalgic for the 2010s. I am not sure if that is a good thing or not, but it plays into what is so great about this show. Parks and Rec is partially about the America that exists, but mostly about the one that should exist. What Michael Schur, Greg Daniels, and Amy Poehler have put together is an America in which red tape is no obstacle and goals can actually be accomplished. It showed that it takes a lot of hard work to get these things done, but they are not impossible. This is the kind of skeptical optimism not seen anymore. Cynicism is fun and funny at times, but at a certain point it just gets unproductive. The fictional town of Pawnee which Leslie Knope and her work family inhabits is a special place. Sure, it isn’t perfect. It’s a little unsanitary and it suffers from a candy addiction. The neighboring town of Eagleton seems a lot nicer from a distance. However, Pawnee is a place that all of these people can love and call home both in spite of and because of its flaws. And thus, the most truthful and nuanced view of patriotism came from a sitcom on NBC once meant to be nothing more than a spinoff of The Office. I would say that I want to move to Pawnee, but I feel like I already live there, because Pawnee is both the America that currently exists, as well as what America could potentially become. This entry was posted in Uncategorized and tagged Adam Scott, Amy Poehler, Analog This, Aubrey Plaza, Chris Pratt, Great American Sitcom, Leslie Knope, NBC, Nick Offerman, Parks and Recreation, Pawnee, Rashida Jones, Rob Lowe, Ron Swanson on February 25, 2015 by ian0592.